If your Home Menu's looking a little cluttered these days, you might want to anticipate the new 3DS system update in a few days that adds folders to the mix. You'll be able to create folders to hold as many as 60 tiles each, which should certainly de-clutter that menu. You can name your folders too, which should make finding those 3DS demos a lot easier. It's part of the same update that will allow Mario Kart 7 to get a shortcut-fixing patch. The update should land on 25th April. It's nice to see the 3DS continue to get more and more refined. The difference between the 3DS now and a year ago (when there wasn't even an eshop) is like night and day. I know that line.. Except, "Update" would be "Rescue". Anyhow, nice to see folders in the mix. Now my menu will be a lot cleaner. If only we could have different colored folders though. But this is good enough. All about functionality anyhow. This is pretty cool. My menu is getting a tad cluttered with VC games. It's good to know I'll be able to put all of 'em in one folder. This to me is almost like the same thing as what the SD Card Menu is on the Wii. I do like the idea of folders being added onto the 3DS Home Menu to store games that clutter up the 3DS interface. But wouldn't it also mean that it takes a nice amount of memory away from the 3DS System Memory and the SD Card also? That I don't get? @3DSLUIGI I don't think the folders themselves would take up much space at all. I would be surprised if a folder took up even so much as a single block. YES. I have such a cluttered screen. Delicious organization. We have almost filled my sons menu screen with content. Maybe 10 tiles left. This will be a welcome addition. Id like to see an sd card menu on the 3DS as well. It took way to long to get one on the Wii. I was hoping Nintendo wouldve already added this to the 3ds menu. ... Why am I so happy over this? That's great because I have 2 rows of Gameboy, 2 rows of GBA, two rows of NES, 2 rows of DSiWare, and 2 rows of 3DSware. This will be really helpful!!! This is gonna be one of the better 3DS updates. Finally folders! Finally we get something that is actually useful and tatatataaaaaa it is no announcement of more abandonware in the eshop.. yaay..
@GreenSpleen The number of available tiles on the home screen increases over time as you fill it up - I'm not sure what the limit is, but it is unlikely that you would be getting to the same situation that occurred with the Wii - don't forget that all 3DS downloads are saved to the SD card anyway. I agree that an SD card menu is essential for DSiWare downloads though. OH YEAH! Brilliant update. Cant wait for this. I need to start planning! @knuckles we already got our games so we're basically back to being normal customers now and Nintendo will eventually release GBA games, maybe not soon but eventually. In a way it's kinda bad for us because on the weeks they sell the games we already own we got nothing to look forward to which is what they did to us with the NES gmes well not in Europe but in America since NOA mainly gives us 1 new release a week so on the 2 weeks they released Mario and Metroid I had nothing to buy since I already had those games. All we have to look forward to are save states which are good but not amazing. So does no mention of Find Mii 3 mean thats probably not going to be included in the update or does anyone think that we might be supprised? this is a nice addition by Nintendo. I have so many games/apps, especially with being an ambassador. Take that clutter! Sweet news indeed. Now I will longer need to display my menu in super-zoomed out mode. Good news! This will be very welcome. Awesome! I've been using about the smallest icons you can get just so I can see everything that I play all in the same screen. This should clear things up. I'll probably keep a lot of stuff front and center for my convenience, but it'll be nice to move all of those demos and miscellaneous channels out of the way. Now its time for facebook, twitter, and youtube app!!! swapnote is kinda boring only because your limited to whatchu can actually do.....we need sumthn we can better communicate to our friends with!!! I'm a bit too excited about this. I must love keeping things organised. IT's about time for an update! 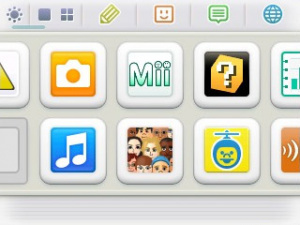 And howsabout having "themes" like the old DS to change the color of home menus, etc? Why haven't they given us more options? This news fills me with joy! I have a very unpleasant home screen with demo's, trailers, downloaded data all over the place. And as for the MK7 glitch fix, Huzzah! Is the DLC function still coming? I already have my screen very sorted out. But with this update, it'll be easier to alphabetize! No, wait, I'll use the Dewey Decimal System! Or something! But yes, I am actually looking forward to this. This is, in my opinion, the biggest piece of news Nintendo dropped yesterday night (yep, even bigger than NSMB2, which will probably not be breaking any new grounds). I've been waiting for folders on the 3DS since a long time ago. Can't wait to organize my ridiculously cluttered menu screen. Will there be an update to make the 3ds blocks more than 1054 for the Dsiware games? I'd prefer my Heroes to be able to get past the Level 7 that they are stuck at! Great stuff. Funnily enough I was expressing my desire for this sort of thing (though it was regarding the Wii U's menu) just a couple of days ago in the forums. It's like they read my mind! There's no need for an SD Card menu on 3DS as it can load items directly from the inserted SD Card. Wait, I don't have any Gameboy Color titles! Welcome addition, I'll have to see how it looks. Hopefully, there'll be a collapse/expand all feature and the ability to place folders inside of folders. I wish they did this for Wii. I actually had to get a 2nd SD Card just because the 20 pages of the SD Card menu were full to the max with VC, WW, channels, demos. I still had 8 GB left on that card, but no channels left, which is plenty of waste. All these games could easily fit on one SD Card if there were more than 20 pages, or an option to make folders. I'm more excited for this than someone probably should be for folders. I love keeping my menu neat and tidy and organized and these lovely things will help greatly with that! Not to mention, this gives the 3DS menu a near-limitless number of slots. Now we just need DSiWare playable straight off the SD card and all will be right with the world! So in other words: This update lets you display more games (if you have a large ds card of course!)? That's good news! However, I would also like the option to switch dsiware games to a sd-card instead of copying! "Now we just need DSiWare playable straight off the SD card"
Glad the update isn't too far away, this will be very useful. Nice but, i would really like it if they gave us a method to organize notes in Swapnote. A folder for each friends' notes would be great! This is good. My home menu is overflowing! Yay! Organization! Everyone could learn a little something about that from Nintendo! Can't wait! Can't wait because I want to put all my games in folders I have 105 games so that is good plus I already made a list of what is going in certain folders.